Saint Patrick's Day is coming up. Whether that means celebrating your Irish heritage, wearing green, or drinking a lot of beer, let us help you celebrate! The Part of the Blog Where Luke Gives You an Unwanted History Lesson. 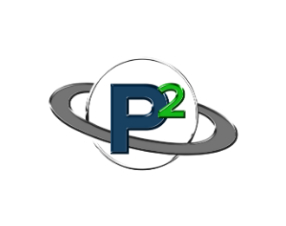 What is, today, arguably the biggest drinking holiday of the year, has its roots in the late 5th century with Patrick of Britain, who is credited with converting pagan Ireland to Roman Catholicism. In the hundreds of years since this patron saint of Ireland's death on March 17th (the year is hazy), he has taken on a mythical, folk hero status and has become a global symbol of Ireland, in spite of the fact that he was not Irish himself. You've probably heard that there are no snakes in Ireland. You're wrong. Legend has it that when Patrick came to Ireland, he eliminated all snakes from the island in a show of God's power over evil. In actuality, Ireland, being an island surrounded by cold ocean water, was snake free long before Patrick. In recent times, Ireland has actually lost that status, as people there with pet snakes have released them into the wild. To celebrate the revered saint's holiday, why not make a "snake" knot bracelet. 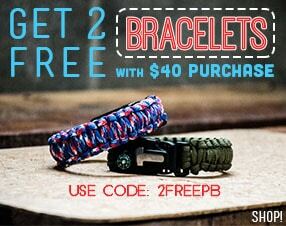 Made popular by the Mad Max movie, the snake knot paracord bracelet has been all over the internet lately. This simple bracelet is really only one knot, repeated over and over and over. 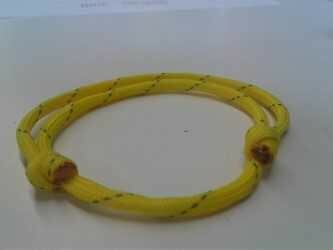 Once you get the knot down, its not very hard to turn it into a bracelet. 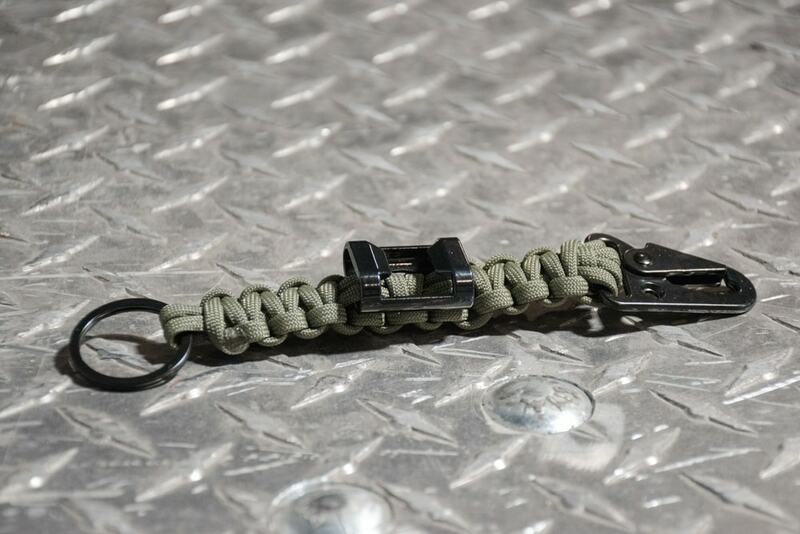 Depending on your wrist size and closure type, you will need 6-10 ft. of paracord for this project. You can find instructions for a basic snake knot here. If you would like to see how the closure is done for the Mad Max style bracelet, click here. The Flag of Ireland has a pretty cool back story too. Do you know the meaning behind the colors? Green represents the native Irish catholics (thanks to Patrick) and orange represents the protestant supporters of William of Orange. I won't get into a detailed account of the conflict—I'm not up on my Irish history—but what is now the Irish flag, symbolizes peace between catholics and protestants. The white between the two sides meaning peace. A majority of Irish, today, would still identify either as Catholic or as one of many protestant varieties. 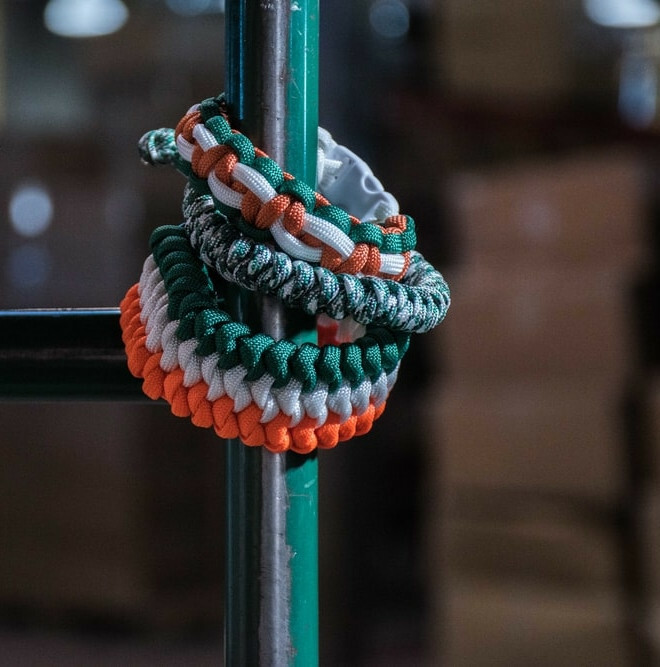 Celebrate your heritage, or show your patriotism, by making a paracord bracelet with the colors of Ireland. Continuing on the snake theme, the top bracelet in the stack picture is a standard cobra weave, but with some white cord laced into it afterward. If you want to do the lacing, you will need a fid. The bracelet uses about 6 ft. of both orange and green, and 2 ft. of white for the lacing. The bottom bracelet in the stack is a triple snake knot. It looks pretty complicated and I almost didn't attempt making it myself, but once I started, I found out it was a lot easier than it looked. Leave some time for this one, however. It will likely take between 1 and 2 hours to do it properly. Tightening down each knot takes some time. Once you learn the basic snake knot, all you need to know is how to do three of them side by side. Below, I outline how to intertwine the three snake knots. Making this bracelet, you just loop all three colors through the buckle, and alternate making one snake knot on each color. Leave your snake knots loose until you finish a row and then tighten them down together. 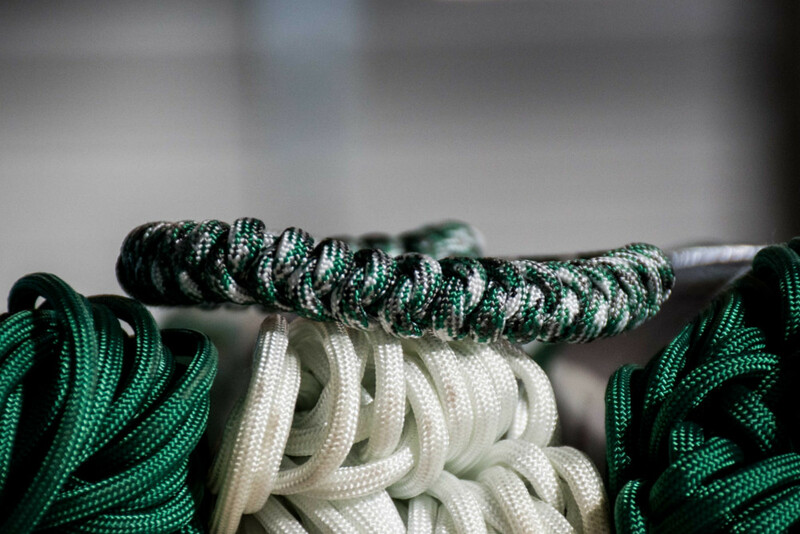 Make a snake knot on your first color. Make the loop with the right side strand of your second color, but thread it through the loop made by the previous color. Pull strand through loop and behind matching strands. Cross that same strand over your other matching strand, going back to the left. Take the other strand (now your right side strand) and poke it downward through the loop of the same color. Do the same with your third color and then tighten down your row before beginning the next. When your bracelet is as long as you want it to be, thread all six of your strands through your buckle in the right order, through the top of the buckle, out the bottom. Using a fid, thread each color through the last four snake knots of their color. Cut, melt, and flatten the ends with the side of your scissors, and you're done. I'm Looking Over a Three Leaf Clover—or Is It Four—or Wait, Five? 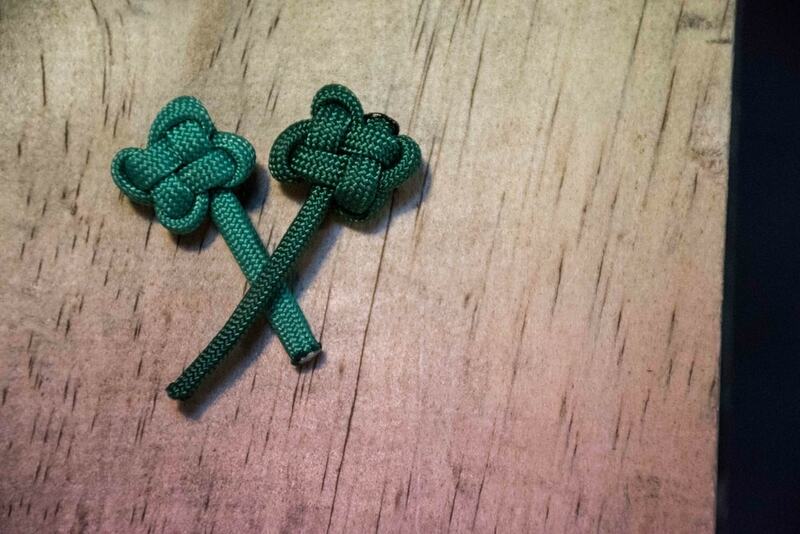 While this clover knot is technically of Chinese origin, it works well as an Irish good luck charm. Ever wonder why four leaf clovers are supposed to be lucky? I did too. Like every other legend surrounding St. Patrick's Day, there are at least two different versions. I found out that, supposedly, St. Patrick used the three leaves of the common clover to illustrate the idea of the Christian Holy Trinity: God the Father, Son, and Holy Spirit. In the other version, the leaves represent Faith, Hope, and Love. The fourth leaf, if present, represents—you guessed it—Luck. Evidently, if you find a five-leaf clover it will bring you not only luck, but also money! This weave works well on bracelets and key chains. "I Just Don't Want to Get Pinched!" Maybe you are thinking, "I don't care about all this Irish stuff, I just don't want to get pinched!" I've got the bracelet for you. This bracelet is for the minimalist—minimal design and minimal effort. 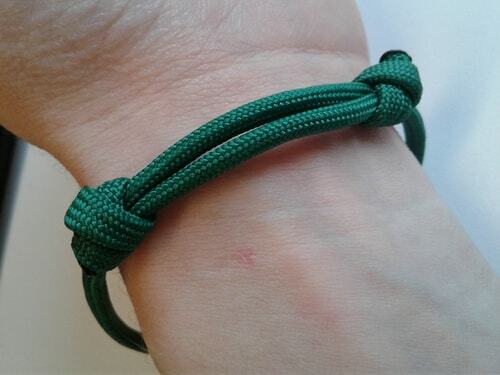 As you can see in the picture, you take a single strand of green paracord, and tie each end onto the bracelet using a slipknot. There you have it: the easiest way to wear green. Don't be caught without a bottle opener this Saint Patrick's day! Wherever your day takes you, you can crack a bottle with this key chain, available soon! Make good decisions and have a safe Saint Patrick's Day! 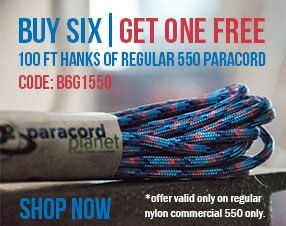 Paracord Planet: Your new one-stop shop for everything paracord.